Elk River, Minn. June 14, 2018 – Many of the top India Pale Ale (IPA) brewers in the country will take part in a first-of-its-kind Minnesota IPA only beer festival August 4, 2018 at ERX Motor Park in Elk River. In partnership with Lupulin Brewing of Big Lake, Minnesota, ERX has invited some of the most renowned breweries in the nation, and the ultimate winner will be the beer enthusiasts who will have a chance to sample this incredible collection of beers. If you’re a hops fan, this is the ultimate sampling event. We’ve challenged brewers to create their most innovative, flavorful, and original single, double, and triple IPAs. This 21 and older event combines unlimited sampling with live music, and a festival atmosphere. Best of all, a generous portion of the proceeds will benefit the Three Rivers’ Community Foundation which provides grants and scholarships for the Elk River area school district (ISD 728). Already a who’s who list of some of the most popular brewers in the Midwest have committed to the event including local favorites Barrel Theory, Blackstack, Drekker, Fair State Cooperative, Surly, and Bent Paddle; along with brewers from around the country like Mikkeller from San Diego, 18th Street from Indiana, and Odd 13 from Colorado. 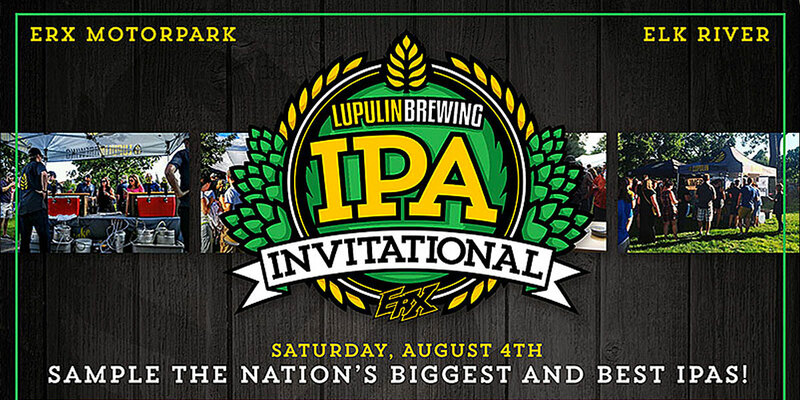 Tickets to the inaugural Lupulin IPA Invitational will be limited and early interest indicates the event is likely to sell-out. A general admission ticket is just $50 and includes unlimited pours. A very limited number of $100 VIP tickets are also available. This upgraded experience includes early access to sampling and free reign of the VIP lounge which includes free Wi-Fi, airconditioning, private restrooms, a well-appointed and comfortable gathering area, and wide array of food samples to accompany your favorite beers. To learn more, purchase tickets, and to sign-up for future updates visit: www.erxmotorpark.com. Tickets can also be purchased locally in the Elk River area by contacting a Three Rivers Community Foundation board member. ERX Motor Park is the Midwest’s premier year-round motorsports and event facility, featuring off-road and snowmobile racing, our very own Beater-X® series, concerts, charitable events and so much more. For a full list of events, visit erxmotorpark.com and follow us on Facebook.